Been a while since I did any freelancing, but I’ve got a review in the most recent Fader (#53). Mucho props to J Shep for the invitation. I’m glad I came to mind when Funky Nassau arrived in the mail. I’ve pasted my take below, where, as I’ve done in the past, I’m publishing my original draft. Not that I’m not happy with the final version, which may be the better for it and which I’m glad is available via pdf (p.142, or 74 in Preview) but, as often happens in the editorial process, the words no longer sound quite like my voice — not least b/c I didn’t actually get a chance to interview Chris Frantz, to my dismay. But someone else did, and I’m glad they added his voice to the piece. The original is a lean 400 words — quite the trick for a prolix mu’fucka such as myself. It also contains some dry humor that, alas, ended up on the cutting room floor, analogically speaking. The brevity of the review means I didn’t get to say as much as I’d have liked about the whole thing and that I accentuated the positive. (Why waste words when there’s nuff niceness to note?) In sum, it’s a fun and interesting compilation. I enjoyed wrapping my ears around it. No reason a lot of the tracks couldn’t play right into the current enthusiasm for all things touched by disco — reggae and nerdrock alike. My favorite track, sin duda? 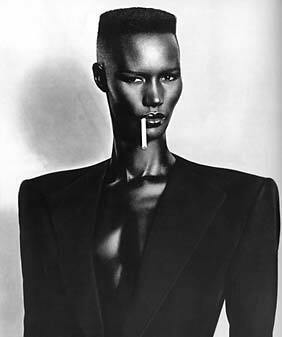 Grace Jones’s “My Jamaican Guy” (12” version) — what an oddly awesome mix of sounds and styles! Synth riff juju over Sly&Robbie disco dub?! What’s not to lub? It sounds improbable, or like a recipe for overcooking: Island Records’ Chris Blackwell sets up a state-of-the-art studio in the Bahamas, invites New Wave / No Wave awk-rockers (Talking Heads, Tom Tom Club, Ian Dury) to come on down, adds an international club icon or two to the mix (Grace Jones, Guy Cuevas), hires a crack house band driven by Parisian-Beninian keyboardist, Wally Badarou, and reggae’s dynamic duo, the drum-and-bass production partners Sly & Robbie, and hands the boards over to influential disco DJs like Larry Levan and François Kevorkian to give the taut, crisp, subtly dubbed-out sounds a proper club mix. It was Blackwell’s attempt to create a studio that was an island in itself, with a sound as distinctive as Studio One, Motown, or Stax. 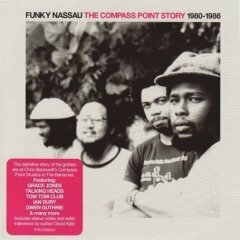 And although the results now sound dated in their own charming way (though many tracks could once again take dancefloors by surprise), the recordings made at Compass Point Studios from 1980-86 didn’t simply distill the era’s post-disco, post-punk zeitgeist, they defined it. AC/DC and the Rolling Stones may have recorded there too, but this is, as the title says, a funky compilation, representing the dance underground of the early 80s, a cosmopolitan scene bridging London, Paris, New York, and Kingston. The tracks brim with an open-minded adventurousness, drawing on the funk, reggae, hip-hop, and African pop animating these cities’ soundscapes and cooking it all down into a lean, mean disco stew. Intended for the club, many of the cuts (collected here in their 12” versions) stretch out into extended instrumentals, seven minute drum and bass workouts that can make one forget the sometimes silly, often whimsical lyrics and focus on the groove. “Reggae’s expanding with Sly and Robbie,” sing Tom Tom Club on their immortal single, “Genius of Love,” and they hit the nail on the bloodclaat head: if nothing else, Funky Nassau affirms the central role that the “riddim twins” played in shaping late 20th century pop. A dubwise approach pervades the proceedings (nuff reverb, echo, flanging, and stereo panning). Sly’s drums sizzle and pop while Robbie’s basslines keep things grounded, making room for the avant-rockers’ flights of fancy. They achieve a remarkably consistent sound despite bringing together so many eclectic styles and idiosyncratic performers. Offering a punchy tour through early 80s international club culture, Funky Nassau arrives just in time to inspire today’s improbable soundtracks for increasingly polyglot cities. Nice piece Wayne, read it in the magazine. Would you put ESG in with that sound ? Good question, Will. I guess in a sense, yes, at least insofar as ESG was bridging (post? )rock and club music. The difference, of course, is the key role that this particular studio — and its amazing house band/producers — played in crafting a distinctive sound across so many different acts. That, to me anyway, makes all the acts on Funky Nassau seem/sound “of a piece,” despite any aesthetic overlap with contemporaries. good looking out wayne. i’m def. gonna cop this one. i popped “my jamaican guy” on at a party not too long ago and my friend remarked “i love this song. i love ll cool j.” i told her that it was the original and she said “i know what it is!” when grace jones came on, she got super embarrassed. it happened the other day too when i was hanging out with some columbia freshmen who were shocked when i told him that all the will smith songs from the mid-90’s were sampled. kids these days! I'm a techno- musicologist, internet annotator, imagined community organizer. I left my <3 in the digital global, but I reside in Cambridge, MA, where I'm from.